Thermionic emission is the release of electrons from a heated metal. The electrons in the metal gain kinetic energy from heat. Electrons that gain sufficiently high kinetic energy will be able to escape from the surface of metal. 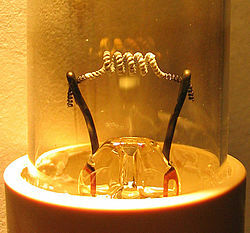 Cathode ray is a beam of electrons moving at high speed in vacuum. Thank You, Aruki Tsuzukeyou for Your Inspiration.